The Pittsburgh Penguins Foundation hosted their 7th annual Penguins Charity Night on Saturday, March 3 during the Penguins home game against the New York Islanders, raising a record-setting total for the Penguins Foundation and Mario Lemieux Foundation thanks to the generous contributions of the team’s fan base. Just over an hour before the contest, hundreds of fans lined up inside and outside of PPG Paints Arena to lay claim to one of 450 Black Penguins Charity Duffel Bags available for $250. The Black Penguins Charity Duffel Bag included a chance to receive an autographed Penguins jersey in addition to: a guaranteed autographed puck, Back-to-Back Champions coffee table book, Back-to-Back Champions bobblehead set, 5X Champions hat and much more. In addition, 6,300 Black Penguins Charity Duffel Bags were available online to fans located outside of the Pittsburgh region. Fans also jumped at the opportunity online to purchase the limited edition Gold Penguins Charity Duffel Bag for $1,000, which guaranteed an autographed Penguins jersey plus all items included in the Black Penguins Charity Duffel Bag. 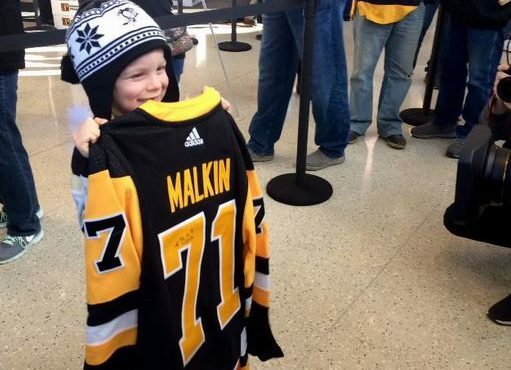 Between purchases at PPG Paints Arena and online, a total of 7,500+ Penguins Charity Duffel Bags were sold raising over $2.4 million for the Penguins Foundation and Lemieux Foundation. This was the largest total raised in seven seasons in partnership with AT&T SportsNet (formerly ROOT Sports). The television broadcast and AT&T SportsNet on-air team provided invaluable exposure to both charities throughout the game, while encouraging fans to donate to these great causes. All proceeds from Penguins Charity Night will support the Penguins Foundation youth initiatives, including the H.O.P.E. program to combat opioid addiction and the Oneder program focused on helping children with special needs excel in the classroom. In addition, proceeds will support the Lemieux Foundation’s cancer research and patient care initiatives, as well as Austin’s Playrooms for children and families in medical facilities. Of course, this event would not have been possible without volunteers from AT&T SportsNet, FedEx and World Vision, who helped pack and prepare the Penguins Charity Duffel Bags for shipping. This season marked the second consecutive season that a Penguins Charity Duffel Bag will be shipped to a buyer in each of the 50 states, which is a testament to the passion of the Penguins’ fan base. In addition, Penguins Charity Duffel Bags will be shipped to 10 Canadian provinces.